Private Grain Terminal owned by Asociación de Cooperativas Argentinas. Inaugurated in 1985. Vessels berth on 4 dolphins, frontage 176 m with outlying head and stern mooring bollards. Vessels of up to 275 m LOA have berthed. Supply from storage is via two inclined conveyor belts to the overhead loading gallery which is supported on 4 latticed towers stepped onto platforms adjacent to the dolphins. Loading is via 4 multidirectional arms provided with dust supressors with chutes at their extremities which are swung out over the vessel, outreach 22 m, loadrate grain 2200 TPH, by products 1000 TPH. Depth alongside at datum about 12,20 m (40 ft). Air clearance 16 m at datum with loading arm horizontal. Berth fitted with 2×12´´ pipelines for vegoil with reduction to 8´´, loadrate 850 TPH. Immediately down river, a barge pier with one fore and 2 aft dolphins, for grain or fertilizers discharge. 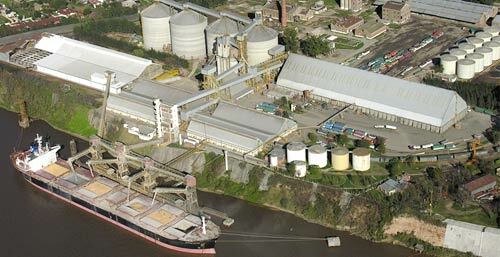 Terminal storage capacity grain 240.000 ton, fertilizer storage capacity 50.000 tons, oil 36.500 ton. Grain reception ex trucks 1200 TPH, wagons 800 TPH. Parking for 500 trucks, railway siding for 90 wagons. 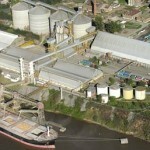 Fertilizers are discharged by grab/ship´s crane at aprox 500 TPH basis three gangs. Bunkers by barge subject to ACA´s authorization.